Click here if you want to join Rugby RCC Click here to see the 2019 Club TTs. Please note that helmets & rear lights are compulsary for all riders in our club TTs. Front lights are recommended. Results of Club TT held 17th April. It was a win for Greg Brookes on the modified K10/10 course at Princethorpe. Go to Results to see the details or Results Index to see all the events. Go to Tables to see the points so far. Also there's a list of the Vets results and the Vets (& Women's) tables. We have problems with the old system we've had in use since 2015 and are in the process of replacing it with an entirely new system. This won't be active for a few weeks, so we're trying to continue with the old system for a while. We'll keep everyone informed as we go along. Watch this space! Our 3-up TTT will be held on Monday 8th July. To help with the lap scoring and provide more precision this year we hope to have electronic timing. Further details to follow later. You may not have ridden an open event and are wondering what's involved and how to enter. Go to riding open TTs to find out more. We have had to increase our entry fees because the CTT have increased the levies on all events. Our committee have agreed that next season members will have to pay £3.50 per ride, with £4 for private trials.We will continue to subsidise U-18s still in education by charging £2 per ride. Members can make one payment of £73 to cover membership, TTs and teas. The actual levies we pay to the CTT have increased from £2 per ride to £3 for club events and open levies from £2 to £4. Apart from administration costs the levies cover 3rd party insurance and a national drug testing programme. See Fees for more information. You can pay your membership fees via PayPal, or by cheque, or even cash! Full membership is still only £10, or you can pay £73 up front to cover membership, a season's TTs and refreshments. All riders in Rugby RCC Club events should wear a helmet and have a working rear light. Also we strongly advise the use of a front light, though not compulsary, The club will have a couple of spare lights available to anyone who forgets. Anyone not conforming will not be able to ride. The Committee decided to restore the role of Club Captain and asked Dave Elliott to take this on. Read Dave's message to our members. You can check on the 2018 season's club TTs - Go tol points table and Vets table.. Go to Index to see the results of all our events for 2018. Paul Thurman has taken over as the person responsible for club clothing. For more information go to our clothing page to find out how it works. The good weather continued for our 3-Up TTT at Mallory Park, with a field of 30 teams taking part. Click here to see the results. The AGM was held at Dunchurch Village Hall on Tueday 5th February. A few changes to the Committee and an interesting discussion on our investigations into electronic timing. We've gathered up all the technical atticles we've posted in recent years and put them together on one page. Go to technology to remind you what you could be doing. The booking system for club TTs closes at 4 pm prompt on the day of the event, but it's still possible to enter at the event if there are spaces. If you're unable to make it please remember to cancel so that someone else can move up the order. Now available - disc wheel valve hole stickers with club logo at £1 per set of 4. - see Paul Thurman..
We aim to raise its profile of the club and the committee should be more identifiable. We've started this process and hope to expand it to include volunteers and helpers who are so essential to the running of the club. Go to committee to see how this page is progressing. A win for David Mead for the second year running in our Open event. After a long hot spell the weather affected many of the original 120 riders for our main event, resultng in 35 non-starters. Go to Rugby Open TT Index to see details of the event. No apologies for repeating this message from last year. Gloomy evenings show many riders would benefit from a front light. Timekeeping at the finish reinforces this message and it's easy to see how an oncoming motorist could miss a cyclist travelling in the opposite direction. Modern lights don't add much weight and could save a big repair bill, (or even your life). We have spare lights which riders can borrow if they forget. 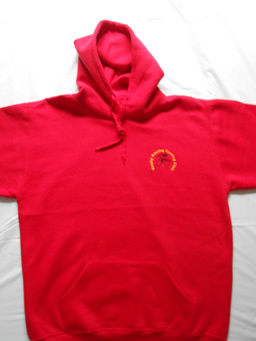 We now have hooded tops, with club logo embroidered, available in S, M, L, XL & XXL at £16 each. 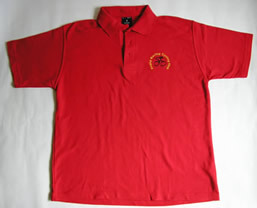 Here's our polo shirts, with club logo embroidered, available in S, M, L & XL at £10 each. Rugby Velo wins the 2018 inter-club event after a 12 year wait. With James Garrett fastest rider on the night Rugby Velo finished with a 3-51 margin, based on the fastest 6 riders in each team. This now makes it 11 - 5 in Rugby RCC's favour. Go to inter-club results to see the details, or previous years to see the history of the event. According to our WebCounter you are visitor no. to our site.